In our one previous article, we discussed about STM32 ARM Cortex M3 Boards which can run Arduino. Arduino Due is basically official version of those boards. The bootloader is preburned in factory from Atmel and is stored in a dedicated ROM memory.Difference of Arduino Due With Other Arduino Boards is the 32-bit ARM Cortex M3 Microcontroller Which Forces the Board to Supply Maximum of 3.3V. The board is faster, specially with graphics and good for robotics to many works. Usually we recommend Arduino boards which are widely accepted, likely to stay on the market, globally available, cheap China clone available. Arduino Due does fall among such possible to “recommend Arduino board”. There was Arduino Tre, which has faster ARM. SAM3X8E features a 12-bit ADC/DAC, temperature sensor, 32-bit timers, PWM timer and RTC. It’s 16-bit external bus interface supports SRAM, PSRAM, NOR and NAND Flash with error code correction. The Atmel QTouch Library is available for easy implementation of buttons, sliders and wheels. 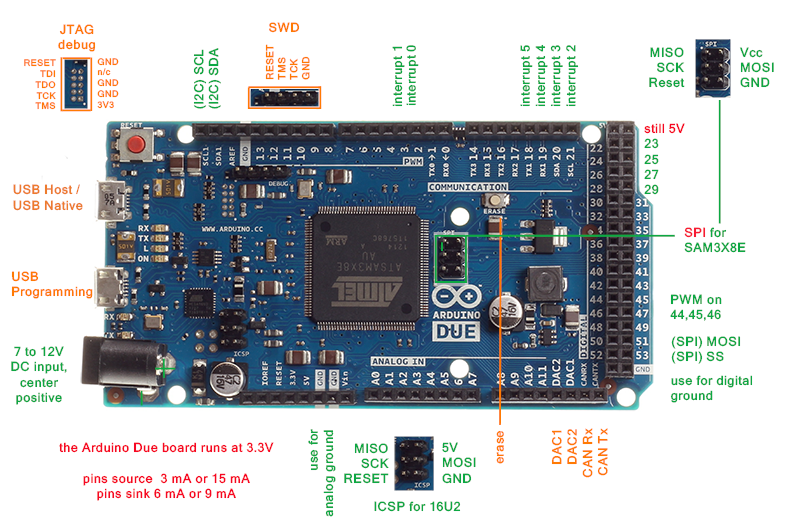 The Arduino Due uses Atmel SAM3X8E ARM Cortex-M3 CPU with 54 digital input/output pins, 4 UARTs, a 84 MHz clock, an USB OTG capable connection, 2 DAC (digital to analog), 2 TWI, a power jack, an SPI header, a JTAG header, a reset button and an erase button. Arduino UNO lacks erase button. The board can connect to a computer with a micro-USB cable, compatible with all Arduino shields that work at 3.3V, and almost all sketches. It is possible to erase the Flash memory of the SAM3X with the onboard erase button which will remove a loaded sketch from the MCU. Nice, is not it? Why 3.3V? 3.3V logic is more popular than 5V logic outside hobby-grade components, outside the Arduino ecosystem. Actually we fear, cross-check to use 5V pin out of works with 3.3V. 5V is really huge. We actually power higher voltage things like motor by external power with star configuration of power supply. But a shield which needs 5V power to respond will not work with Arduino Due. There are more funny things. Arduino Due can run embedded Linux. The real issue is the lack of RAM, but the DUE can support external RAM. Obviously, Arduino Due supports other IDEs. So many features actually yet short to compete with Arduino compatible STM32 ARM Cortex M3 Boards for that price and also features. Official Arduino Due is really good for the relatively newbie interested in “real electronics”. You can actually use ATmel Studio instead of Arduino IDE. None really will say Arduino Due is bad. We would say – it is a expensive, easy starting to get rid off n00b grade electronics. It does not means you’ll throw away Arduino UNO. Due does lack ready to use many of the “shields”, all code & library may not work. Arduino Due clones are for getting extra on-board features. Cite this article as: Abhishek Ghosh, "Difference of Arduino Due With Other Arduino Boards," in The Customize Windows, May 31, 2018, April 21, 2019, https://thecustomizewindows.com/2018/05/difference-of-arduino-due-with-other-arduino-boards/.